The news of singer/pianist Mose Allison’s passing on November 15 made me quite sad as I had the feeling to have lost a friend I never knew. From 18 to 26 I was one of those truly dislikeable Frank Zappa fans who run around all day pestering people who he thinks are just too ignorant and dumb to understand what a genius Zappa is. Nowadays Zappa leaves me cold (except his first couple of LPs with the Mothers Of Invention and his orchestral music). a) teaching me there is more to music than 4/4. d) making me listen to Mose Allison. And I absolutely fell in love with the man, his music and his lyrics right away. Mose was witty, wise and cool and straightfaced sarcastic and laconic and sometimes very funny and on top of that a very fine pianist. Two things about that statement. First: Cow Cow Davenport was black. Second: I think Mose Allison’s secret was that he sounded very white if one can say so, but he sounded cool and hip nonetheless. 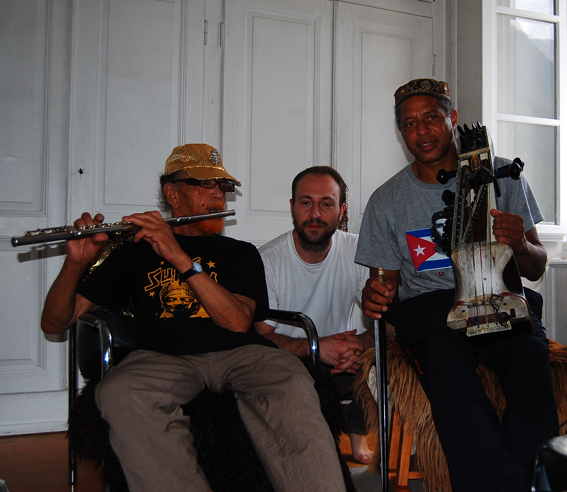 His way of playing and singing the blues is sophisticated and down home at the same time – a hard task. Strangely enough all of my jazz friends never shared my enthusiasm for Mose Allison, “Yeah, nice, but not my style”, was all I could ever get out of them. So after a while I stopped with my new hobby: running around all day pestering people who I think are just too ignorant and dumb to understand what a genius Mose Allison is! So after that it was just a thing between me and Mose, the cool poet. 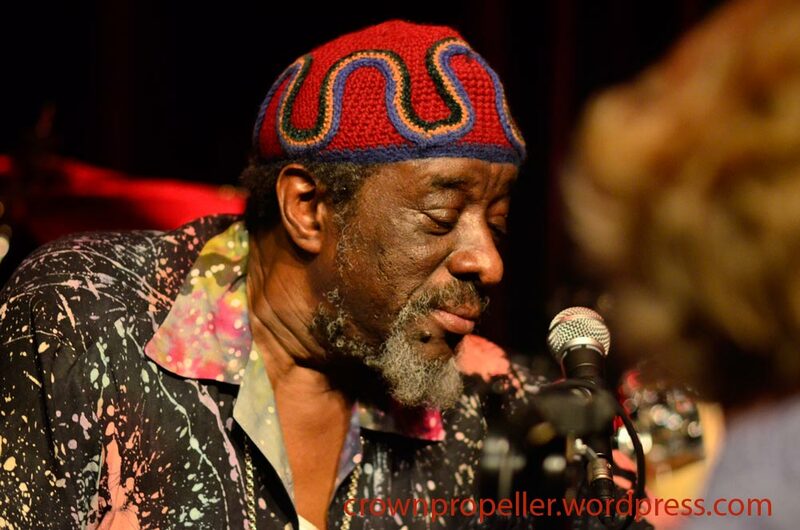 And Mose the prophet: Here is what he had to say – in 1968 – about the state of things in 2016: “Jus Like Livin'” – the first piece of Mose’s that I’ve ever heard – was recorded in Los Angeles on July 9, 1968 with Red Mitchell on bass and Bill Goodwin on drums. The new year did not have a chance yet to proove whether it is going to be good or bad, but I already have the blues. Because while going through the old VHS cassettes of my friend the late jazz researcher Otto Flückiger, I found two wonderful TV documentaries about female blues legends, made in the 1980s. So I have decided to put them up here – although the picture quality is not too good. The first one is “My Castle’s Rocking”, Stuart A. Goldman‘s beautiful portrait of Alberta Hunter (1895–1984), made around the time she had her comeback at age 82. The second one is the award-winning PBS feature “Three Generations Of The Blues”, which, made in the early 1980s shows a concert by Sippie Wallace (1898–1986), Big Mama Thornton (1926–1984) and Jeannie Chatham (1937–). When the weather is hot like it’s now, there only two kinds of music I can listen to: Old school dub reggae or the Blues. Since I guess there might be some people among my subscribers who love the Blues as much as I do, I am offering you a bunch of rare concert clips – some of them actually quite long – featuring masters of classical electric blues playing. The first clip features something different though: Legendary singer Jimmy Witherspoon who is more out of the vintage r’n’b /jazz school. Here is Witherspoon in Nice on July 9, 1979 . Witherspoon is accompagnied by Eugene Edwards (g), Roy Alexander (org) and Maurice Simon jr. (dr). They are playing Everyday I Have The Blues,I’d Rather Drink Muddy Water, See See Rider, and Jimmy Reed’s Big Boss Man. With Clark Terry (tp) as a guest on one track (I had published that on youtube before) , Bob Margolin (eg), Guitar Junior (eg), Pinetop Perkins (p), Calvin Jones (eb) and Willy “Big Eyes” Smith (dr). The next clip comes from still the same festival. Here multiinstrumentalist Clarence “Gatemouth” Brown is featured with the Wallace Davenport New Orleans All Stars giving us some Street Corner business. Gatemouth Brown appeared at the festival again on July 14 1977 accompgnied by Billy Mitchell (ts); Lloyd Glenn (p); George Duvivier and J.C. Heard (dr). 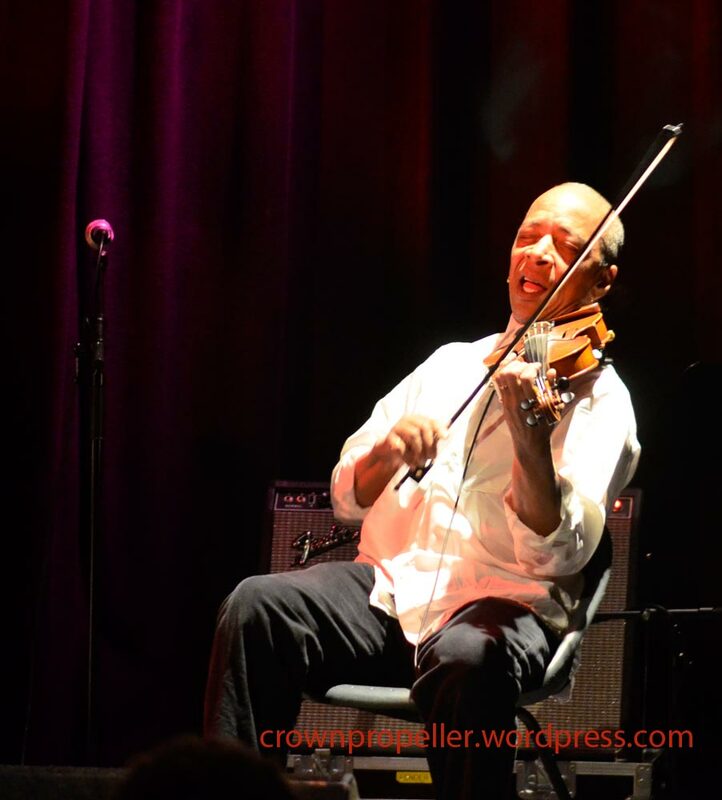 I had already put up a part of that gig on youtube and had presented it in this blog entry. In this part here they are playing: Lets Groove (you know that ain’t it’s title) and If You’ve Ever Been Mistreated in which Brown changes to violin. Gatemouth Brown deserves to be much better known! And finally from Chicago here is Otis Rush, filmed in an unidentified venue somewhere in Switzerland around 1986 (not from Montreux as far as I can see). Otis is playing with Professor’s Blues Revue: Professor Eddie Lusk (keyboards), Anthony Palmer (guitar), Fred Barnes (bass), Eddie Turner (drums). (Thanks to Mark D. for information!) Beware though: It takes a while before Mr. Rush appears. 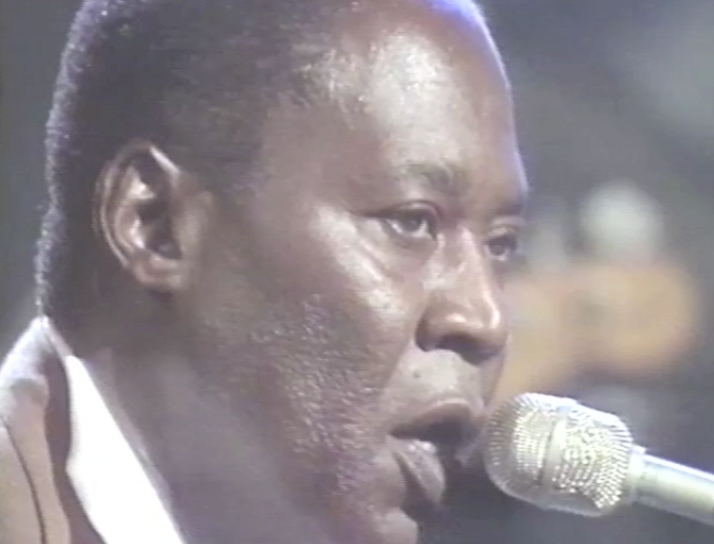 While digitizing the Donald Byrd footage from Montreux, I discovered a nice thirty minutes of video featuring blues piano legend Memphis Slim from the same festival. Since I synchronized the whole VHS cassette, I thought I might as well put it up on youtube as well. Memphis Slim is one of my favorite blues singers, and I hope you like this clip as much as I do. Slim is accompanied by legendary session guitarist Mickey Baker, bassist Benny Turner and drummer Charles Meyers. Note: I just got the message from youtube that this video might not be viewable in different countries. So I am sorry if this happens in your country. 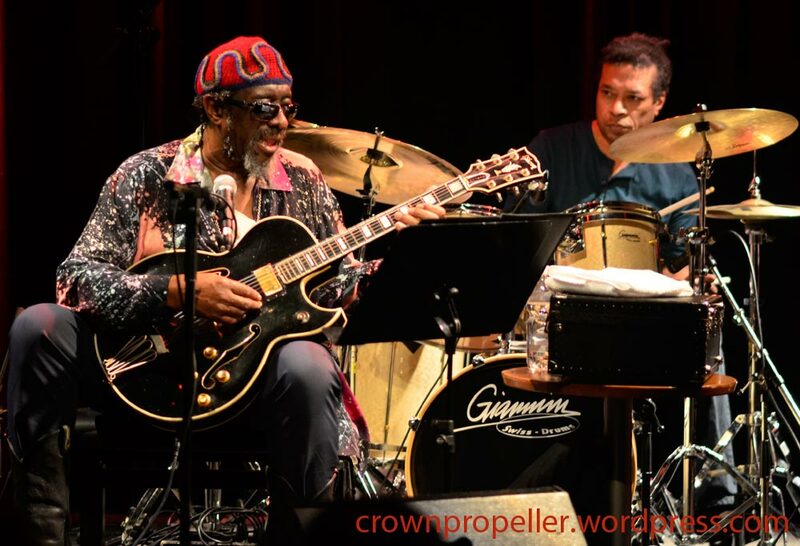 During all of the 1980s, one of my favorite musicians was guitarist James Blood Ulmer. 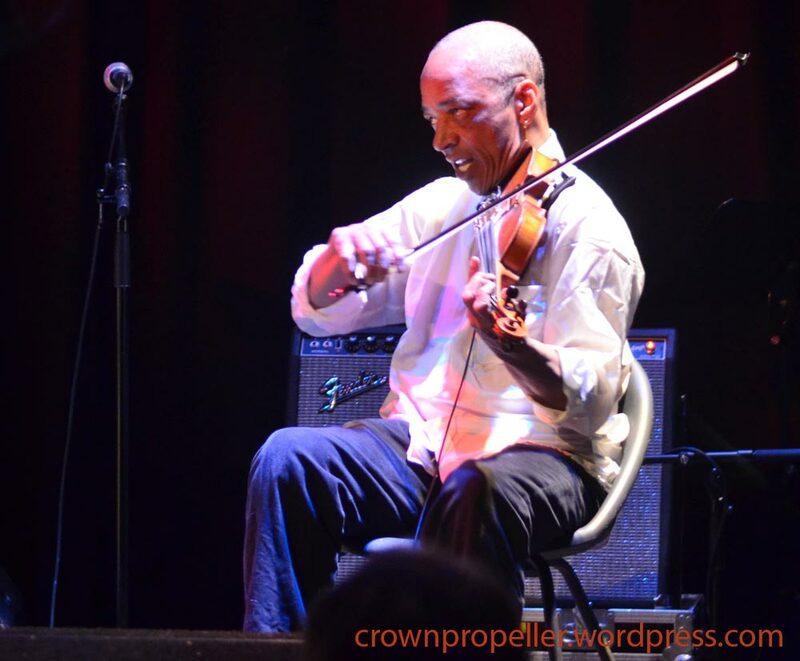 At that time he was playing with his band Phalanx (with tenor saxophonist George Adams) as well as with his “Odyssey” Band, featuring violinist Charles Burnham and drummer Warren Benbow. I managed to see Phalanx live several times then, but I never got to see the Odyssey band. I lost my interest in Ulmer a little after his 1990 release “Blues All Night” which in my ears was totally overproduced and sounded much too clean. Although I bought the Music Revelation Ensemble’s 1994 CD “In The Name Of” when it appeared (a great album by the way), I never came to see Ulmer live again since 1989 or so. 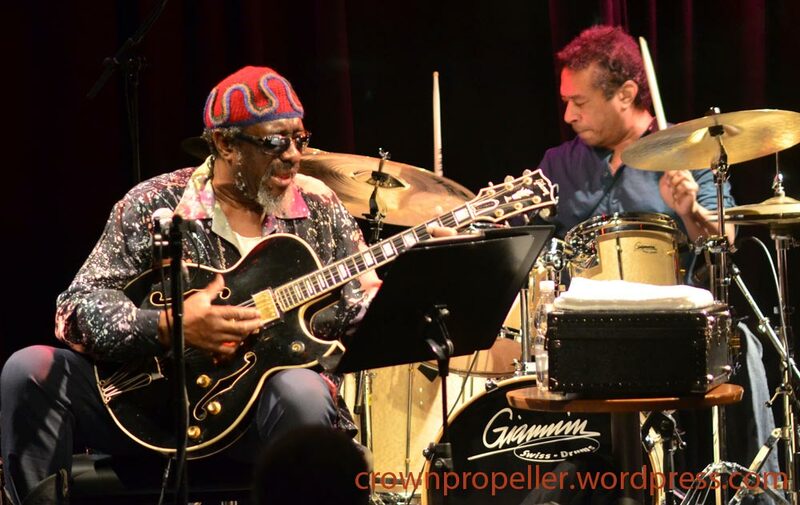 So it really was a nice surprise when I opened up the morning paper last wednesday and noticed that James Blood Ulmer’s “Black Rock Experience” was to play at the Moods Jazz Club in my town that night. The band as announced was to be Ulmer with bassist Mark Peterson and drummer Grant Calvin Weston and singer Queen Esther. I somehow had the feeling that the music might be in the vein of the “Blues All Night”, which I relistened just before going to the gig only to find out that I still do not like it too much. Much too my surprise the personnel for this evening turned out to be Ulmer with the old Odyssey band: Charles Burnham and Warren Benbow. And featuring Queen Esther. 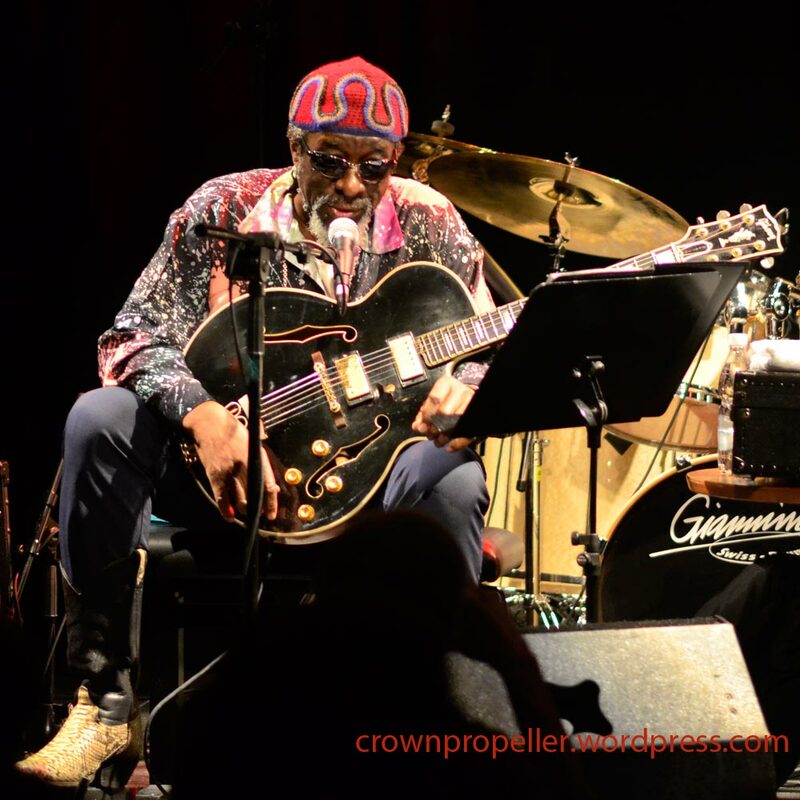 And it turned out to be a great evening of deep Blues from earthy to abstract, splashed with dots of free funk, and salted with harmolodic spices. I made some nice photos during the concert, which was started off by Ulmer doing a slow and melancholy – nearly painful – solo rendition of the U.S. National Anthem. 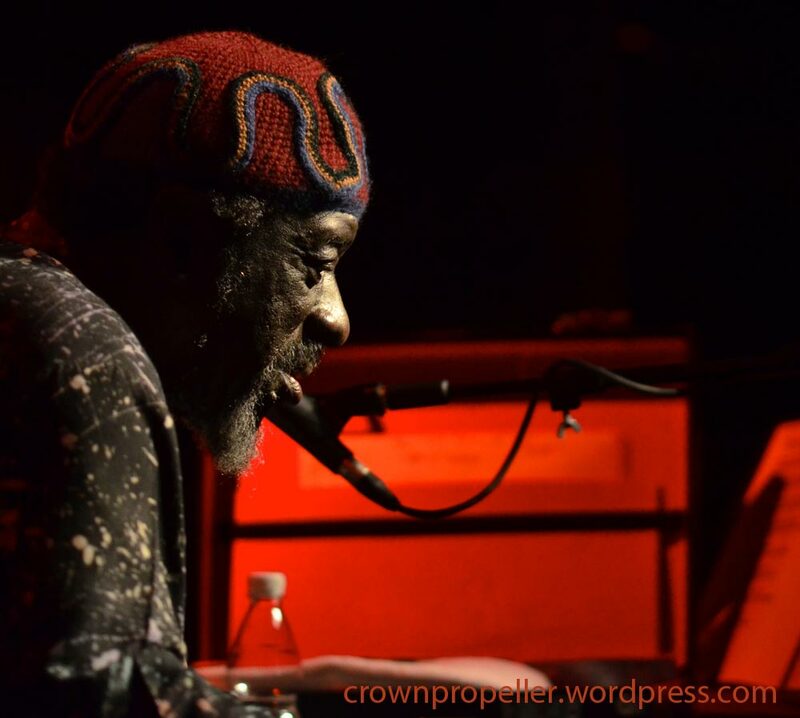 (click to enlarge) James Blood Ulmer at “Moods”, Zurich, January 23, 2013. 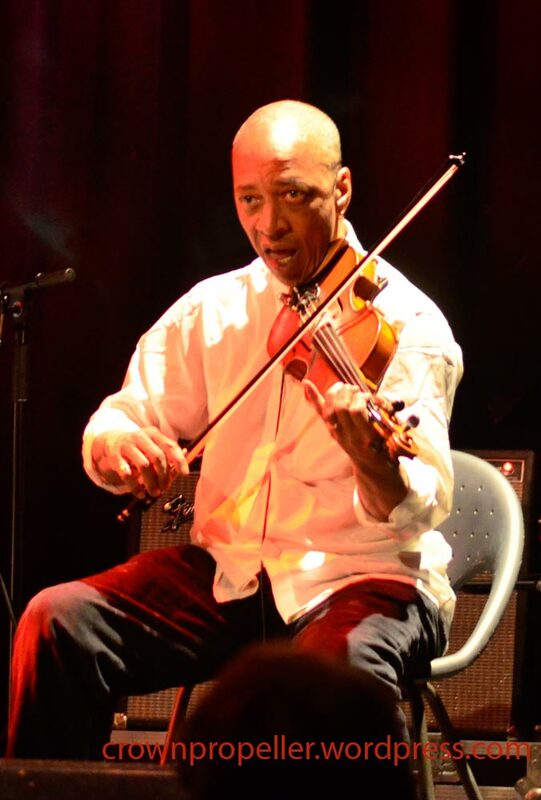 (click to enlarge) Charles Burnham at “Moods”, Zurich, January 23, 2013. 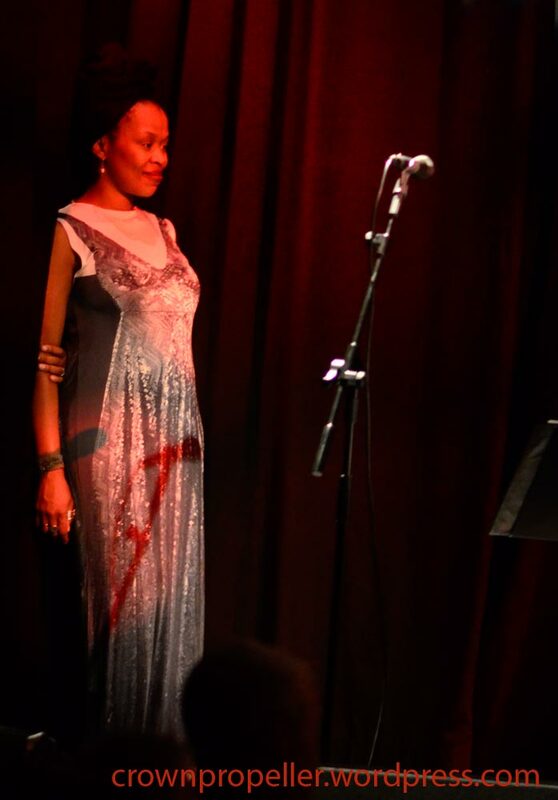 (click to enlarge) Queen Esther at “Moods”, Zurich, January 23, 2013. I had a tele lens on my camera, that is why you never get to see the whole band at once. 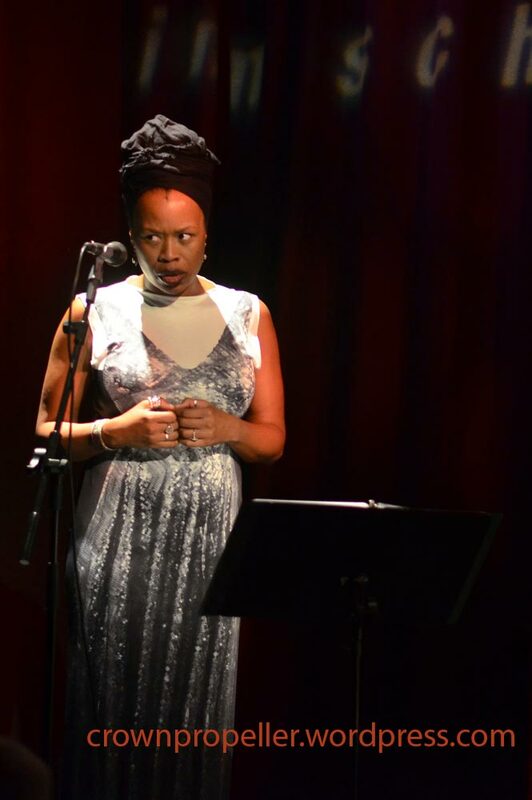 I would have loved to hear more of Queen Esther who really has a great voice. One of the evening’s highlights was her acapella rendition of “We’ll be Together Again”. Although I originally did not plan to – else i would have taken a small tripod – I filmed parts of the concert. I had a very unconvenient standing position so you might get seasick when watching the three tracks I have edited down from the footage. I would say that the nauseating shakiness takes any commercial potential out of this clip, but if someone with the right to object objects against this video being on youtube, I’ll be taking it down in a hurry. I managed to come a little closer and take some nice shots of Ulmer after the concert when he was selling and signing CDs from the stage. I know it has been a little quite on this blog for some time now – which had several reasons. First there was a lot of work at the office – which in turn made me want to do absolutely nothing when finally time for my holidays came up. Then again these holidays were overshadowed by the passing of a friend from cancer of the pancreas two weeks ago. Tomorrow there will be a memorial event in the club where this friend – a bass player – played in a C&W/R’n’B/Surf/Polka trio every sunday for years. I visited him in the hospital a few days before his passing and that’s when he asked me to supply the music for his memorial event, since I was his favorite house DJ of the club over all this years – “and make it happy music”. To put on happy music tomorrow will not be easy, to say the least. But of course I will try to oblige. In dedication to my deceased friend I offer you an excerpt from the german 1980 TV documentary “Chicago Melodie” which involved german Boogie Woogie pianist Axel Zwingenberger visiting, playing with and interviewing several Chicago Blues Legends. This one here shows Estelle “Mama” Yancey (January 1, 1896 – April 19, 1986) singing “Make Me A Pallet on the Floor”, an often recorded song that goes back to the 19th century. Yancey is accompanied on piano by Irvin Helfer. Someone did already put this up on youtube, I know, but unfortunately that version is not synchronous. Here is another clip from the same TV series (La Grande Parade Du Jazz) that the Gatemouth Brown clip comes from. This time you get the Muddy Waters Blues band featuring guest trumpeter Clark Terry playing T-Bone Walker’s classic “Stormy Monday Blues”. This was filmed in Nice, Southern France on July 10, 1977. Besides Clark Terry, Muddy’s band consists of Bob Margolin (eg), Guitar Junior (e.g. ), Pinetop Perkins (p), Calvin Jones (eb) and Willy “Big Eyes” Smith (dr). Harmonica player Jerry Portnoy was also a member of Muddy’s band at that time, but he is not featured in this number.